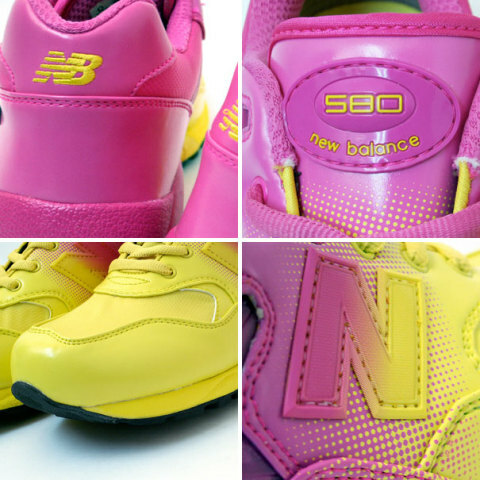 New Balance 'Sunshine & Pink' Shoes Are Some Stealthy Sneakers... NOT! New Balance MTG580 SP running shoes are a limited edition sold only in Japan, the Land of the Rising Sun... and why not? Having seen a sunrise or two in my day, I can say that the resemblance is, for want of a better word, frightening. 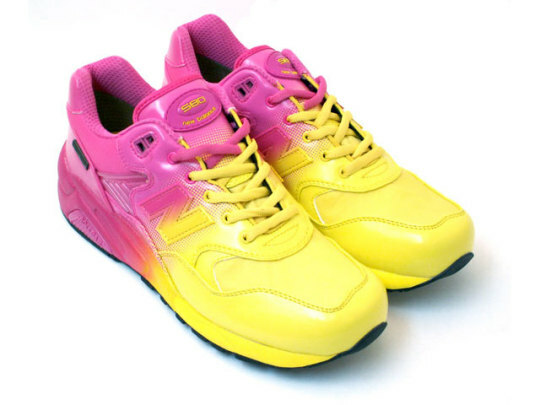 With leather and nylon mesh uppers tinted in Sunshine Yellow and Bright Pink, if you wear these shoes before sunrise you just might be mistaken for one. Eye-scorching colors aside, New Balance has handled the application of the radical tinting in an innovative manner. One color flows into another through a dot matrix gradient that ignores differences in materials. Even the New Balance "N" and the shoelaces are affected. Like all New Balance athletic footwear, the MTG580 SP is designed with the needs of the user first and foremost. Each shoe features a ROLLBAR® with Medial & Lateral TPU Posts providing the ultimate in motion control, and an injection-molded EVA foam (IMEVA) midsole gives cushioning that's firm yet flexible. On the inside, Ortholite® foam inserts deliver comfort, breathability and odor resistance over the long term. The New Balance MTG580 SP's main comfort feature is announced with a pair of small metal tabs mounted on the outside of the heel: GORE-TEX®. Yep, the modern miracle fabric is incorporated into what NB calls a "Performance Comfort Footwear lining" that offers (in addition to comfort) waterproof protection and durability. New Balance MTG580 SP running shoes sell for 18,000 yen or around $200 per pair, IF you can still find them at Japanese online retailers like Rakuten. If you like the shoes' features but wish they weren't that godawful color, watch out for New Balance MTG580 WB, which are a more subdued White & Black. Is there any possible way I can get these shoes? I saw them in a store when I was in Mexico but I cannot find them anywhere else, not online, no where.